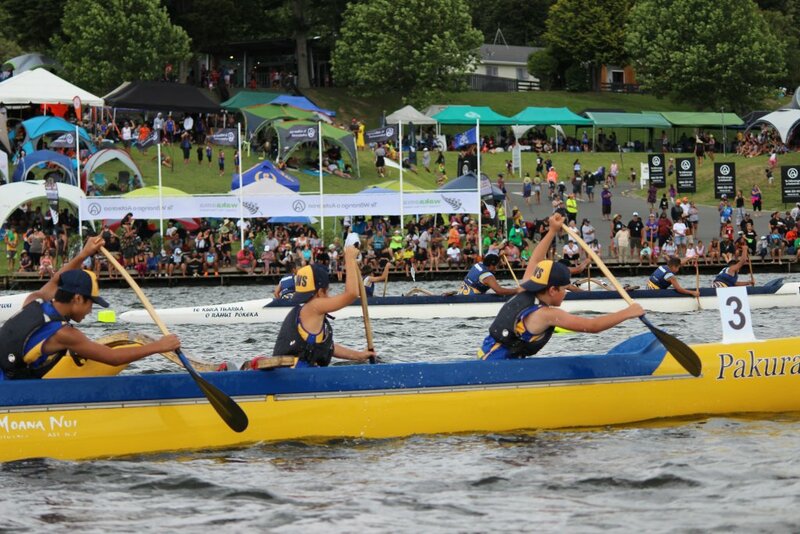 A record-13,000 spectators attended the 2018 National Waka Ama Sprint Champs at Lake Karapiro in January, 2018. Some say 2018 “flew” by, and it certainly feels that way in some respects, but when you sit and think back about what happened in Cambridge over last year, it’s been a pretty big year indeed. We’ve seen the Cambridge Pool close for construction and the Lakewood Development opened, we’ve seen the return of the Homecoming Cross and more stars added to our Walk of Fame, we have celebrated several athletes and good-sorts being recognised at sports and community awards, and commended local causes in raising hundreds of thousands of dollars raised for charity. With so many achievements made by our local residents both here and abroad, you could say it’s been a pretty successful year for Cambridge. We’ve hosted national sporting events of varying kinds, from national barefoot water ski champs and national waka ama champs at Karapiro, to national schools track cycling at the Avantidrome. 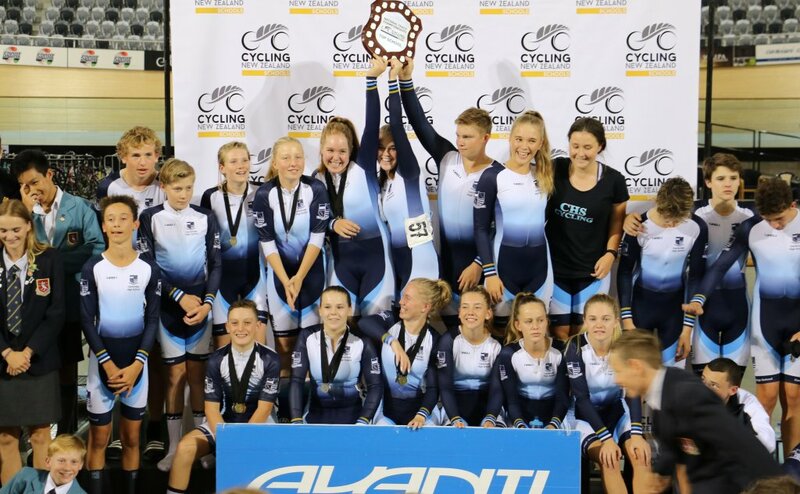 Cambridge High School won the Top School Trophy at the inaugural National School Track Championships at the Avantidrome in March. Photo – Concept78 Photography. The April launch of the BMX national performance hub has increased the chance of world-stage success for local riders selected onto the programme, and the opening of the Canoe Racing NZ high performance facility at Karapiro in February has seen the country’s elite male kayakers move here. We’ve seen a number of Hautapu players make it onto Chiefs teams, too. We’ve seen the sale of five winning lotto tickets in Cambridge – that we know of – four from Victoria Station and one from New World Cambridge, ranging from an $818 Strike ticket to a $1M first division win split with two Aucklanders for $333,333. But the true riches have been in life – with a number of local residents turning 100 this year. 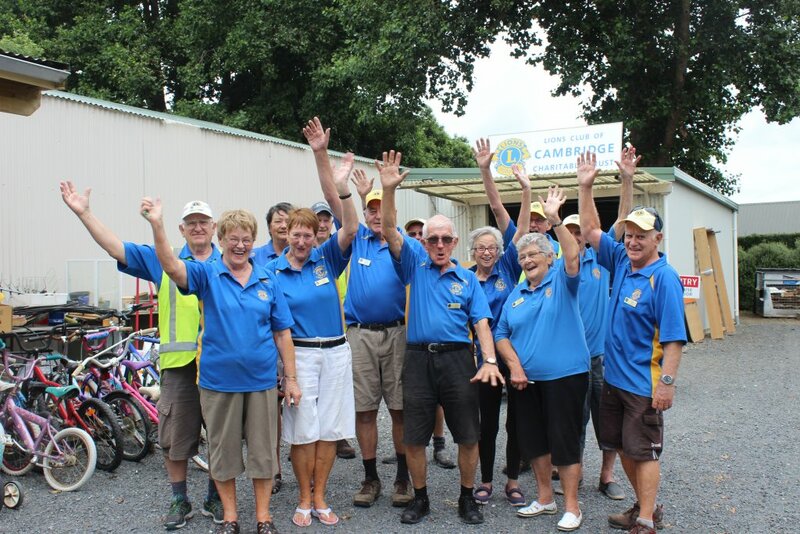 The Cambridge Lions celebrate outside the local Lions Shed after named the biggest Lions club in the country in January last year. 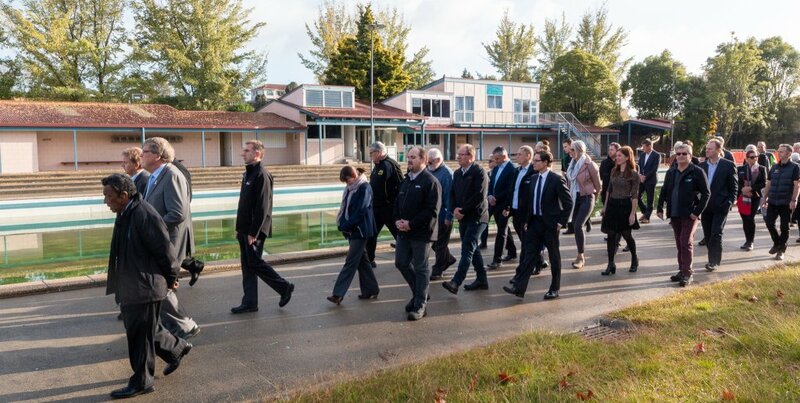 In late January the Cambridge Lions were announced as the biggest Lions Club in the country, and shortly after in February the Cambridge Central Bowling Club set yet another bowls record, this time for the longest singles lawn bowls marathon over 27 hours. We have even discovered pre-European human remains this year, dated 200 to 400 years old, during expressway works in Tamahere, with four children and two adults aged six to 40 found within close proximity to each other. We were a little disappointed to find out recently that the expressway won’t be extended to Piarere, at least not any time soon, but that’s a whole other story. Several artefacts were found in 2018 during expressway construction in Tamahere and Matangi, including pre-european tools, structures and even human remains. 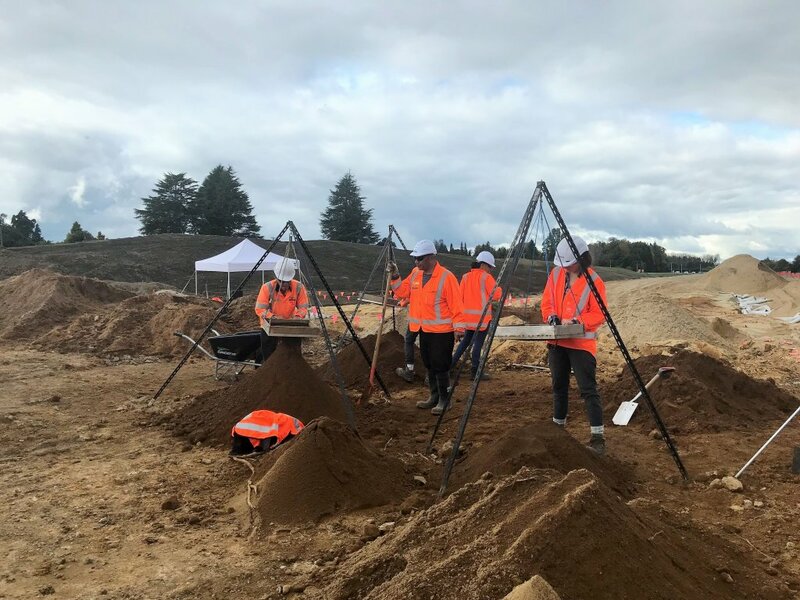 Pictured is Waikato-Tainui and an archaeology team searching through soil at the Waikato Expressway construction site in Tamahere, after human bones were discovered. Throughout the year exascale software company Nyriad has continued to develop world-leading hyperscale computer storage and processing technology right here in Cambridge, growing the company by between 8 and 12 engineers a month after a funding round in February brought in US$8.5M. Other local businesses have developed over the year too, with Countdown and several retailers following the “plastic free” trend, no longer supplying single-use plastic bags. New World will soon be on board too, going plastic free from the first day of the New Year. Plastic Bag Free Cambridge has helped drive the change, making free reusable bags for the public. In other eco-friendly news, Te Ko Utu lake has seen vast improvements in pest management with Predator Free Cambridge’s rat trap project clocking up dozens of dead pests. The lake water is set to improve too, with the Cambridge Community Board discussing ways to improve water quality. 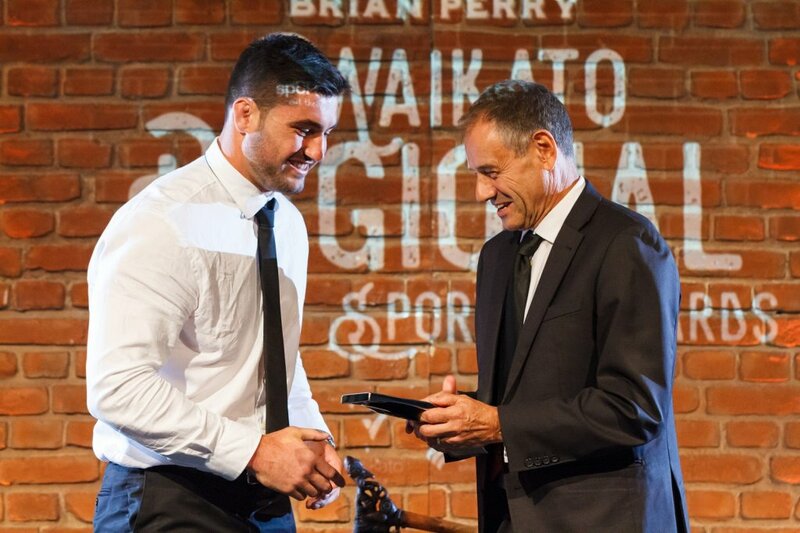 Hautapu and Chiefs rugby player Luke Jacobson was presented with the Emerging Talent award at the Brian Perry Waikato Regional Sports Awards. It was a tough transition for some moving to water meters in July after 11,400 meters were installed across the district in 2017, especially for those on cross-lease properties sharing the same water meter. 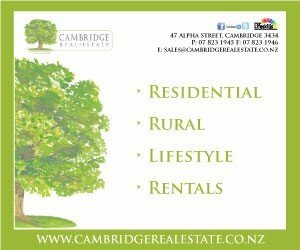 But 85 per cent of those “complex” properties are now paying less with meters than what they were paying when the flat fee was in place, and 68 per cent of Cambridge households are paying less than the previous standard charge of $405.20. It’s not ideal for everybody, but like with the disappearance of plastic bags, we’ve learned to live with it. Here in the Cambridge News office we’ve learned to live with the public piano introduced across the road outside Deli on the Corner. Most of the time, we love it! And when it sounds like someone is bashing it with a hammer, it’s a great opportunity to exercise patience. site blessing was held in May to mark the beginning of construction for the new Cambridge pool complex. Photo – Michael Jeans. We celebrated the 20th birthday of the Cambridge Library building in July, and the 10th birthday of our newspaper in August. We’ve seen a lot of change and growth in Cambridge in 2018, as well as a countless number of successes by our local people. We hope you’ve enjoyed our coverage of these stories, and look forward to continuing to deliver Cambridge news to you this 2019.